Leaf area index was estimated in an 18 ha plot at the logged forest tower site, km 83, Tapajos National Forest, Para, Brazil. The plot was adjacent to the eddy flux tower at km 83, Tapajos National Forest, Para, Brazil. Thirty litter traps were placed at 25-m intervals along two east–west transects in the 18 ha block. Litter samples were collected biweekly from the traps and returned to the lab where they were sorted, air dried, and weighed. The leaf area of a subsample of air-dried leaves was determined using a computer scanner and image processing software. The subsample was then dried in an oven and the air-dried weights were corrected to oven-dried weight. The area of leaf litter collected during each sampling was calculated using the relationship between weight and area measured for the subsample (Goulden et al., 2004). There is one comma-delimited data file with this data set. This data set was archived in January of 2011. Users who download the data between January 2011 and December 2015 must comply with the LBA Data and Publication Policy. Leaf area index was estimated in a 18 ha plot adjacent to the eddy flux tower at km 83, Tapajos National Forest, Para, Brazil. Thirty litter baskets distributed within the grid were visited bi-weekly. Leaf area of the collected leaves was measured using a scanner and using the relationship developed between leaf area and dry mass leaf area index was scaled up. 2 Day_cum days "Cumulative days since January 1, 2000"
5 Trap_area cm2 "Total area of litter traps (30 traps multiplied by 10000 cm2 for each trap)"
The data set covers the period 2000/09/01 to 2001/08/31. Biological process including photosynthesis, evapotranspiration and decomposition of organic matter among others and the resultant generation of fluxes between the surface of an ecosystem and its overlying atmosphere are related to both the quantity of biomass, both total and green, in the canopy as well as the architecture of the canopy. These biophysical parameters control the radiation balance in the canopy interior and the mechanisms that underly the atmospheric exchange of water, energy and CO2. Biophysical parameters are components of the biosphere models used in climate simulation studies of the Amazon Region (Costa and Foley, 2000; Rocha et al. 1996). For the Amazon, which is both spatially extensive and heterogeneous, there are still few measurements of some of these parameters such as Leaf Area Index (LAI). LAI is an important regulator of canopy conductance and thus in turn plays a role in estimating local and regional scale fluxes (Shuttleworth 1988, Rocha et al. 2004). Here we present LAI estimates using a method that calculates LAI as a function of annual litter accumulation based on the relationship between dry leaf mass and area. While this method requires more investment than traditional methods based on fresh leaves due to the time and effort involved in collecting and drying the litter, it pays off through reduced uncertainties in the estimated value of LAI. The data have been checked and no further changes to the data are anticipated. This work was done at the Tapajos National Forest (TNF), a 6,000,000 ha conservation area of of humid tropical forest with a mean canopy height of 40 m. The study site is located 50 km south of Santarem, Para via an access road at km 83 of the Santarem-Cuiaba Highway. Mean annual precipitation of 1,911 mm has been recorded at a weather station in Belterra, Para 50 km from the study sites (INEMET 1992), with a dry season extending from August through November. 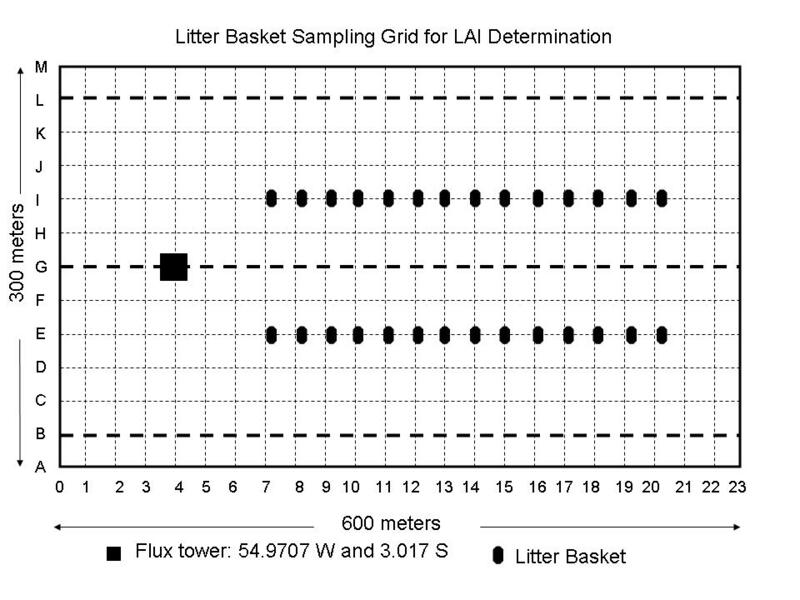 Thirty litter baskets were located on two E-W transects within the grid. Each litter basket measured 1 m x 1 m and was supported 0.1 m above the ground. Baskets were visited bi-weekly starting in late September 2000 and litter collections followed Newbould (1970). Litter from each basket was air-dried at the LBA laboratory in Santarem, sorted into 4 categories ( leaves, wood (< 2 cm diameter), reproductive parts and miscellaneous (material that could not be identified as well as insect bodies and frass). Area of the leaves for each collection ( reserving sub-samples of approximately 50 % of the total mass) was determined from scanned images (Scanner HP Scanjet 6300C) using the Rootedge application (vers. 1999). With a number of different sub-samples a linear relationship between foliar area and dry weight was determined. This relationship was then used to estimate the foliar area for each collection trap. Our estimate of leaf area index (LAI), defined as the area of leaf tissue per unit of surface area in m2/m2 (Monteith 1973), was calculated using the cumulative mean foliar area of collections over the course of one year. This hypothesis assumes the lifespan of leaves from tropical trees to be approximately 12 months as suggested by Medina and Klinge (1983). Data are available through the Oak Ridge National Laboratory (ORNL) Distributed Active Archive Center (DAAC) . Goulden, M.L., S.D. Miller, H.R. da Rocha, M.C. Menton, H.C. de Freitas, A.M.E.S. Figueira, and C.A.D. de Sousa 2004. Diel and seasonal patterns of tropical forest CO2 exchange Ecological Applications 14(4) Supplement, 2004, pp. S42-S54. INEMET (Instituto Nacional de Meteorologia) 1992. Climatological averages(1961-1990), INEMET, Brasilia, DF. Newbould, P.J. 1970. Methods for estimating the primary production of forests. IBP Handbook No. 2. Blackwell Scientific Publications, Oxford, England. 62 p.